"As Aug. 29 recedes into the conscious time of many Americans, the great storm that devastated, fades into a black hole of media obscurity.....So, why does that matter? It matters first as it relates to journalism's obligations to cover human beings whose conditions are as dire as those that exist here." See the full editorial here. Five years after Hurricane Katrina hit the Gulf region, the area is still recovering from the disaster -- a recovery now compounded by the worldwide recession and the effects of the BP oil spill. There are several noteworthy photography-related projects that have covered the destruction and aftermath of Katrina. We have assembled a small selection below for this blog. The New York Times Lens blog ran the photo-essay, "Dave Anderson in New Orleans". "What can one block tell you about a devastated city? Plenty, says Dave Anderson, 40, a photographer who chronicled the lives of people reclaiming their homes after Hurricane Katrina in the newly published “One Block: A New Orleans Neighborhood Rebuilds” (Aperture). He decided instead on a project that would take in the place and its people, in details small and large." See the full essay here. Stephen Wilkes' project "In Katrina's Wake: Restoring a Sense of Place" reclaims and gives a voice to forgotten places and people. The series of large-format photographs portrays the victims of two devastated Gulf Coast communities: Bay St. Louis, Mississippi, and the Holy Cross neighborhood of New Orleans Ninth Ward and their struggle to restore their lives, homes and the social fabric of their communities. Selected images from "In Katrina's Wake" has been exhibited at Monroe Gallery and prints are available. msnbc.com has a great Photoblog, which features "Conversations sparked by Photojournalism". A recent post showed photographs of the Gulf Coast immediately after Katrina, and now, five years later. The Boston Globe has a great photo blog, and they have just posted Remembering Katrina: Five Years Later. Photography-collection.com is reporting that Umbrage Editions is publishing the forthcoming book, COMING BACK: New Orleans Resurgent, featuring the imagery captured by Getty Images photographer Mario Tama, with a introduction by Anderson Cooper. KatrinaDestruction.com has almost 2,500 Hurricane Katrina Photos Images and other Graphics Displays. http://www.photosfromkatrina.com/ has a specific look at some of Katrina's catastrophic effects on the Mississippi Gulf Coast. The New Orleans Museum of Art will present the exhibition UNTITLED (New Orleans and the Gulf Coast 2005): Photographs by Richard Misrach. 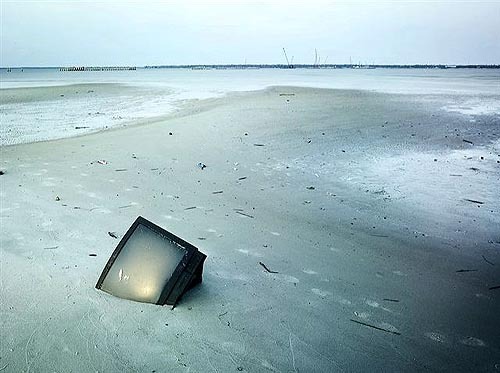 The photographer Richard Misrach spent three months documenting the devastation on the Mississippi Gulf Coast after Katrina. Read a related article here. 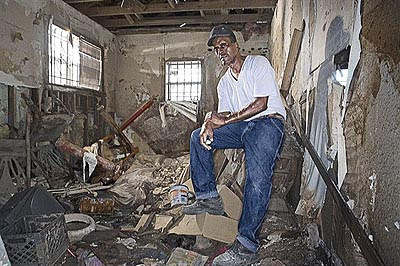 The Ogden Museum exhibit "Telling Their stories: The Lingering Legacy of Katrina Photography" is an exhibition of photographs taken during the roiling 2005 tragedy that "remain as crisp and clear as the moment they were shot." Feel free to add other Katrina-related photo stories in the comments section.